I went into the class having kayaked a few times, but never really knowing proper technique, etc. This was a great class to just get some basic information on safety, efficient strokes, and how to plan for safe kayaking trips in general. There is a lot more detail that goes into kayaking than you'd realize. The instructor was great and very personable. Great information- Scott was wonderful! Exactly what I needed to learn! This was a great intro class! Scott (our instructor) has a great deal of knowledge and many years experience. I look forward to taking an excursion led by him sometime. Highly recommend. The class was very informative. 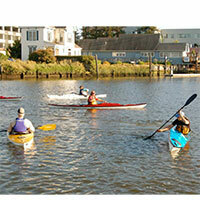 I would have loved to have more time on the water learning but it was very enjoyable. I am in the process of deciding whether I want to get a kayak. This class was a good first step in that direction, and the instructor was fun and engaging. From Jack Fink of Benicia, California on 7/6/2013 . Shane was an excellent instructor and provided the basics of kayaking, from paddle technique to getting in and out of the kayak, in a simple and understandable way. I would highly recommend taking this course as it will definititely enhance your kayaking skills and make the experience much more enjoyable. From Anonymous of Petaluma, California on 2/28/2012 . 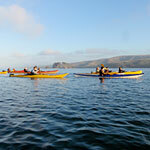 My Husband and I took the beginning kayak class this last Sat with Shane. We wanted to say we thought she was great. She is really good at explaining and demonstrating techniques. My skills and confidence increased a lot in just that short time. I wish I could go on the women's trip next Sat but will be out of town. I hope it's scheduled again in the future.